Handmade rosary and rosary crosses - a passion that I never knew I had. I came across this hidden passion by accident and have already written up a more detailed page on How To Make Rosary Crosses. That is by no means a complete catalog because the various ways and different looks that can be achieved are virtually endless. This page here is what I call "WIP" (work in progress). Here, I am just jotting down notes, tips, observations, and learnings as they come to me, especially during the progression of a piece of handmade rosary. It is quite delightful how much one can learn accidentally as one is in the process of just doing. 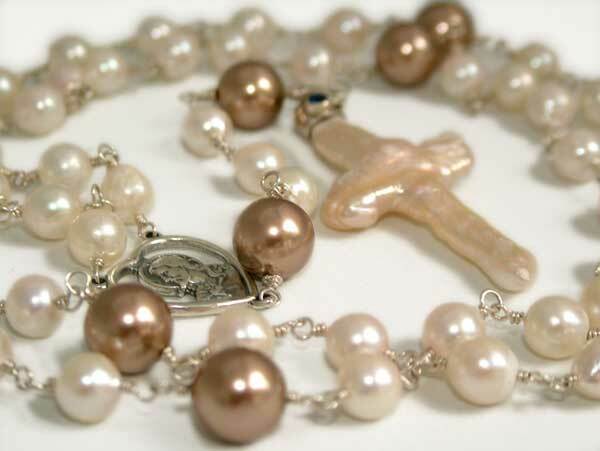 This rosary "Pearls of Worship" makes used of closed links (which I also refer to as "coiled loops"). You can see that each of the connecting loops are completely closed by the multiple coils I put on each loop. This makes all the loops very secure and the rosary is not going to fall apart from an accidental tug on a open loop. 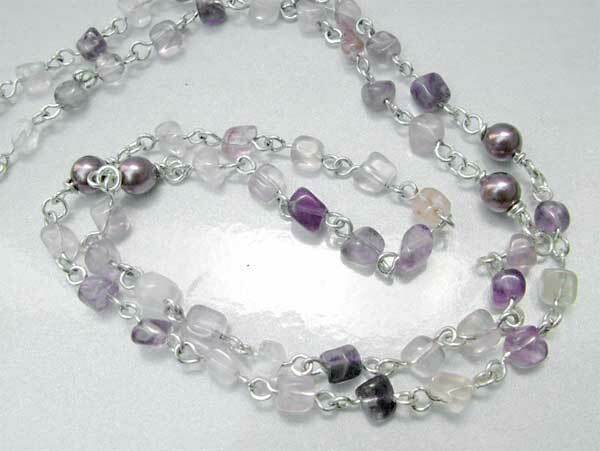 If using precious beads and materials, this is an ideal loop to have. However I also (later) realized that with this kind of secure loops, you do have the disadvantage of your rosary "kinking" every now and then. The user will have to "un-kink" it which is not a big bother but something that you might want to keep in mind. This "Rosary for Mom" was done with open loops (which I also refer to as "uncoiled loops"). You can see that the loops on each bead have no coiling - they are just ordinary loops. This may not be as secure as the "coiled loops" above but with this kind of open loops, there will be no kinking of the rosary chain. This is a third alternative of linking. It is both secure and it will not kink. 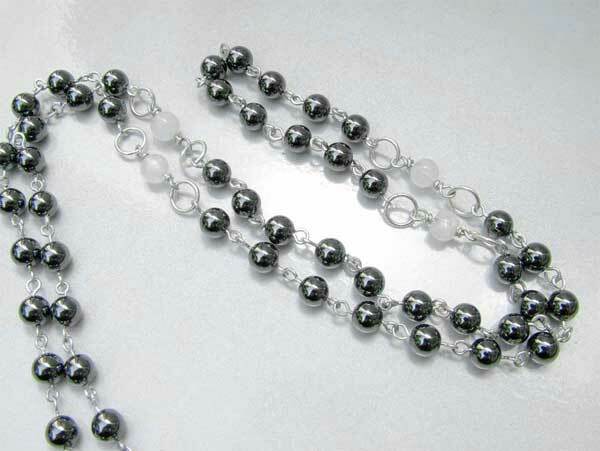 In this Hematite & Moonstone rosary I have used open and closed loops to link the rosary chain together. Between the main beads (hematite/black), I have used open loops. Between the larger (moonstone) bead, I have used coiled loops that are linked to a closed jump ring. This however does add a bit more length to the overall rosary. So it all comes down to choices and compromise, keeping in mind the convenience of an unkinkable rosary chain, or high security for precious materials, and lenght of the handmade rosary.